With the winter season approaching, keeping your outdoor kitchen and living areas clean can seem like a daunting task. Sure, during this time we tend to be a bit more relaxed with the amount of cleaning and maintenance we perform. If you’re reading this article, the chances are that you own an outdoor kitchen area that you would like to maintain during Winter season. We’ve included some maintenance tips you could use that will ensure that your countertops don’t damaged or deteriorate during the winter season. 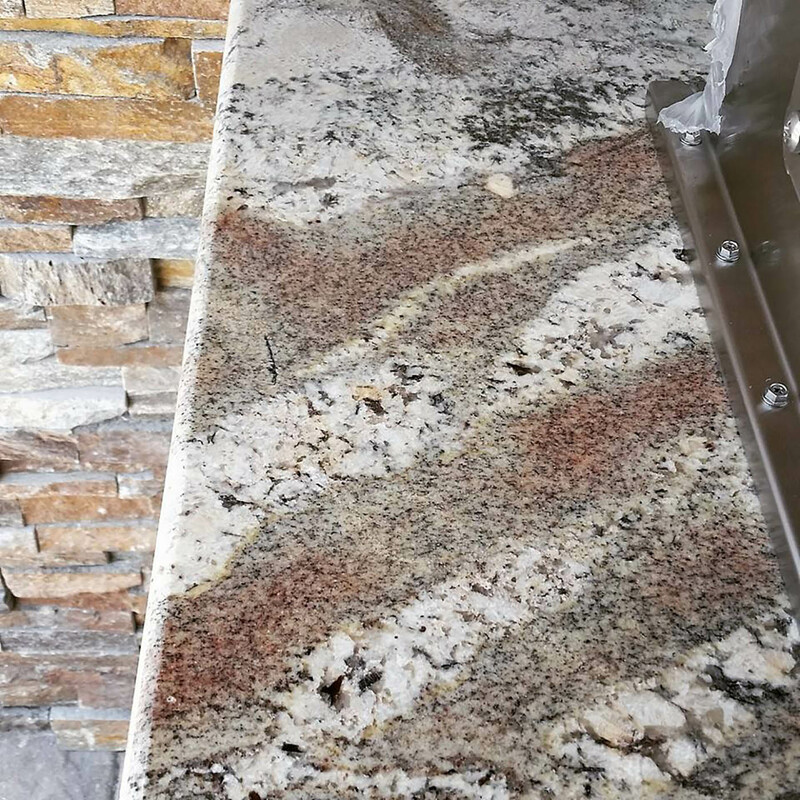 Obviously, one of the crucial steps to maintaining your outdoor granite countertops during the winter is to seal them. Keeping your countertops in good condition largely depends on sealants. Especially if your countertop is exposed to snowfall, sealing your countertops on a more regular basis is of the utmost importance. Increased exposure to moisture will wear out the existing layer of sealant, and we all know that moisture can be detrimental to your countertops. Whether your countertops are granite, marble or quartzite – moisture will adversely affect them. So be sure to seal them regularly! Another aspect to be on the lookout for is the cycle of freezing and thawing. It’s important to watch out for this because the cycling of freezing and then thawing can certainly lead to cracks in your countertops. While there’s not a lot you can do to prevent this, we recommend – as we stated above – that you seal your countertops more regularly. Plus, if your countertops are exposed to snowfall you can brush away the snow to further prevent any stains or cracks. What about Sinks on Your Countertops? This section depends on if your outdoor living area has a sink and is also based on your overall Winter intensity. Be sure that you close off the water valves and be sure that those lines are drained. You can even remove your faucets and store them indoors. When it comes to your elegant outdoor kitchen, countertops are one of your first considerations. Countertops improve the aesthetic appeal of your barbecue Island. Outdoor kitchen countertops are the primary place for food preparation and serving. It’s important to understand how much counter space you’ll need, along with whether you’ll add any features and or components to it. Adding components like a sink or sideburner, or features such as a backsplash are things you must keep in mind. Functionality and durability should be top priorities when building your outdoor kitchen. Looks are important, but not before functionality and durability. It’s extremely important to select a material that will complement the style of your home, along with how you intend to use it. An outdoor countertop needs to be durable, weather-resistant, and beautiful. Outdoor countertops will be exposed to natural elements such as UV rays, heat, humidity, rain, etc. Therefore, durable and weatherproof outdoor countertop materials are of the utmost importance. Other considerations are material strength and resistance to spills, staining and frequent use. Three of the best choices for your outdoor kitchen countertops are stone, concrete, and tile. Stone, concrete, and tile are designed to stand up to the outdoor elements and use. It’s always a good idea to check with the manufacturer before installing. The last thing you want to do is install a countertop material, only to find that it’s made for interior use only. We wouldn’t want your beautiful countertop to fade or deteriorate too quickly. Durable and protective materials can be costlier in the initial construction process, but these costs up front will end up saving you in the long run. If you’re thinking of building a custom outdoor kitchen area and need to speak with a professional, give Elegant Outdoor Kitchens a call today. We’re the premier outdoor kitchen construction company in Southern Florida. Schedule an on-site consultation today!